The Centre for Peace, Nonviolence and Human Rights, in Osijek, emerged during the war in Croatia, in 1992, as a small civilian nucleus focused on laying the foundations for sustainable peace and democracy. Intuitively responding to incentives through interconnectedness and empowerment, a network of people and organisations supporting the peace process was brought to life. We cooperated in three areas: solidarity with victims of war; resistance to human rights violations by one’s own ethnic community; and advocacy for a peaceful ending of war. We prepared the exiles for return to an area which at that time was occupied by Serbian forces. For the past two years, the Centre for Peace in Osijek has been organising its own archives as well as those of other local organisations that document contributions of civil initiatives to the peace process in Eastern Croatia during the 1990s. 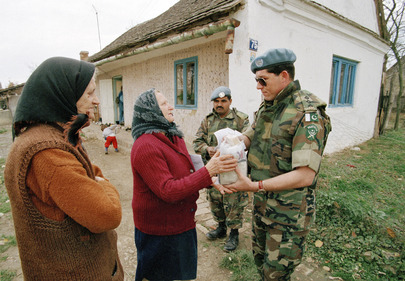 UNTAES (The United Nations Transitional Administration for Eastern Slavonia, Baranja and Western Sirmium, 1996-1998) is considered to be one of the most successful UN peacekeeping missions to date. Eastern Slavonia, Baranja and Western Sirmium were the only war-affected areas which, after the Dayton Agreements, were reintegrated into Croatia by peaceful means, without further human and material losses. The success of the UNTAES mandate has been attributed to the existence of political will on both conflicting parties’ sides (Croatia and Serbia), clearly defined mandate goals, and decisive implementation of the plan by the transitional administrator, retired General Jacques P. Klein and his associates, in all three areas – military, political and civic. Although thousands of women and men (mostly direct victims of war), as well as hundreds of peace activists from local, regional and international peace organisations actively participated in this endeavor, hardly anyone talks about a joint venture of politics, inter-state and state institutions, and ordinary people! Officially Croatia does not celebrate this Day of Peaceful Integration. There are no reports about this peace enterprise in our textbooks. Moreover, during the radicalisation around the introduction of Cyrillic inscriptions in Vukovar, nationalistic public statements appeared saying that it would have been better if Vukovar had been liberated by military intervention – this would have been the final solution of the Serbian question in Croatia. Therefore, we decided to set up the archive. Firstly, we want to preserve and make available to researchers and the general public those records that will encourage historical, sociological, pedagogical and political science research on the civil contribution to peace processes and post-conflict peacebuilding. For years, students, researchers and peace groups from around the world have come to study this unique case of peacebuilding process in Eastern Croatia, but for most of them the individual interviews with people who participated in these processes were the only source they could use. Secondly, we consider precious the fact that this example illustrates how strengthening the capacities of people and communities for building peace helps them to find their way out of the role of victims, to step out of fear or hatred. Moreover, the synergies resulting from the binding of personal development and peace work represent a powerful development potential. It is important that such a development potential is recognized and receives appropriate support, including through the educational system. Finally, we believe that the peace effort should get a place in the narrative of the homeland just as the military ventures do. The contribution of ordinary people to peacebuilding should be praised just as we the contribution of soldiers is praised. A list of references consulted by the author for this blog post is available here. The coordination of peace organisations for Eastern Slavonia, Baranja and Western Sirmium has been active since 1994. It consists of the following organisations: Croatian Anti-War Campaign; Youth action Group, Osijek; “Baranja”, Association for Peace and Human Rights – Darda; Centre for Peace, Osijek; DOS Split; Civic Committee for Human Rights, Poreč; Homo, Pula; Committee for Human Rights, Zagreb; Small step, Zagreb; Miramida-Pakrac; Association for Peace and Human Rights, Daruvar; The Group “484” – Belgrade; Association for Tolerance – Backa Palanka and Sombor Peace Group. ← Looking for a new life to come!